EZ-Gro Zinc (Zn) 10% 10-0-0 is a plant nutrient supplement powder, which exploits amino acid chelation to enhance its bioavailability. Nearly all plants can benefit from the application of Zn, leading to enhanced yields, increased growth, and proper development. 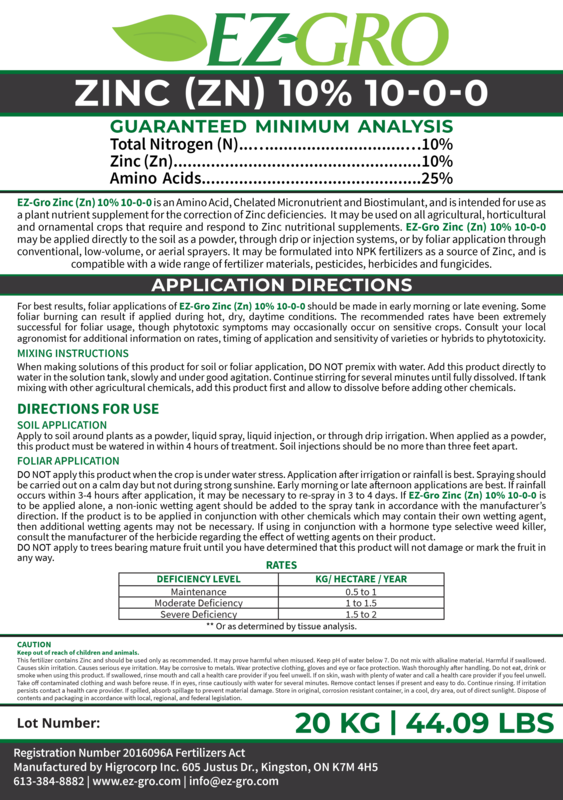 Add EZ-Gro Zinc (Zn) 10% 10-0-0 to your regular fertilizer regime to fix zinc deficiencies and boost production and quality of your crops. • Zinc is an essential micronutrient involved in various growth and development pathways. Without adequate supply, growth will cease and crops may become more susceptible to injury.